Diet has always been a part of the care plan for many diseases such as diabetes, hypertension, high cholesterol, and gout. However, it has only been in the last decade that nutritionists have found that diet has a direct impact on the brain and disorders associated with it. Television is flooded with advertisements for supplements that improve memory and bring back the energy level you once had in your youth. Today, one in nine people over 65 have dementia and one-third of people over 85 have Alzheimer’s disease. However, no advertisements speak of diets and supplements, which are a part of the prevention and treatment of these devastating brain disorders. Extensive research has been conducted to create a diet with a healthy brain in mind. Poor dietary habits contribute to the risk of dementia and Alzheimer’s. Just as poor dietary eating habits contribute to diabetes and high cholesterol, a diet high in saturated fats and low in B-complex vitamins can contribute to Alzheimer’s and the other forms of dementia. Saturated and trans fats, and excess heavy metals are the biggest threats to brain health. Saturated fats found in all animal products encourage the production of destroying plaques in the brain. Trans fats are also fats that contribute to the formation of plaques in the brain. These fatty foods such as fried pork chops and bacon have shown an increase in the risk of Alzheimer’s disease by fivefold. Excess heavy metals build up in the brain and may become caustic to brain cells. 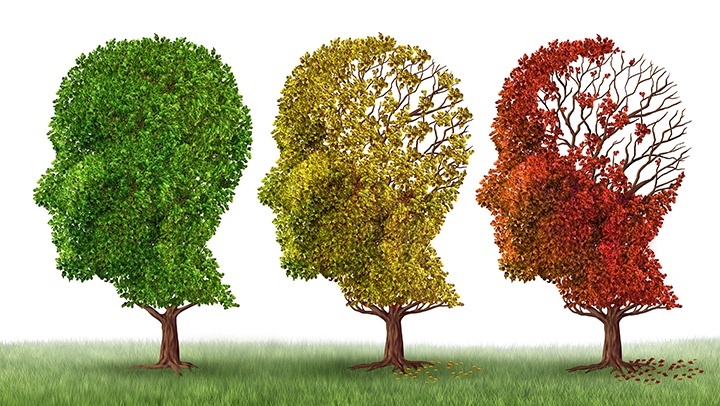 This has directly been associated with many types of dementia and brain atrophy. These heavy metals include aluminum, found in many antacids, and cooking and bake ware. Excessive iron and copper are found in many processed foods, oysters, and Pacific shellfish. Diets, which are high in Vitamin B complex and E, have proven to strengthen the brain and prevent caustic plaque buildup. Foods in this brain healthy diet include nuts and seeds of every kind, fruits especially grapes and blueberries, green leafy vegetables, sweet potatoes, all kinds of beans, avocados, and butternut squash. Eating fish that is rich in Omega-3 fatty acids contributes to brain health five times more than beef, pork, and even chicken. Eating these foods daily will ensure that you are getting adequate B vitamins especially B12 and Foliate. Some people are unable to absorb vitamin B12 from food and it is recommended to take a B12 supplement to ensure you are getting its brain-protecting power. Although diet is one of the most significant strategies in the fight against Alzheimer’s and dementia, it is not the only one. A multifaceted approach including exercise, cognitive and intellectual stimulation, socialization and stress reduction all contribute to the treatment of this devastating brain disorder.